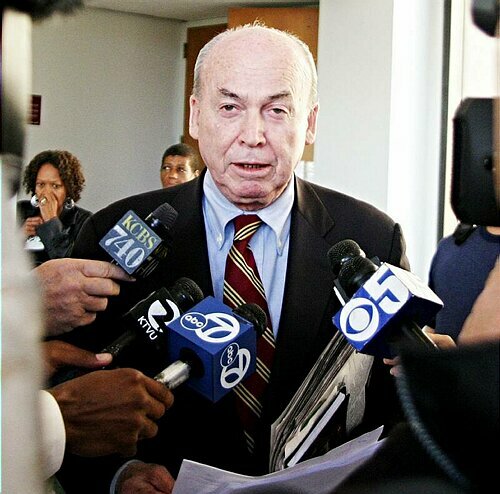 San Francisco lawyer LeRue J. Grim, 84, said he would not contest State Bar Court Judge Lucy Armendariz’s findings before the California Supreme Court, although he repeatedly said he had done nothing wrong and that clients fabricated allegations against him. Still, he decided not to fight the charges. Armendariz wrote that between 2007 and 2009 Grim committed serious ethical breaches in cases unrelated to his representation of Devaughndre Broussard, a dishwasher at Oakland’s Your Black Muslim Bakery who shot Bailey on Aug. 2, 2007. Grim has twice been suspended from practicing law for numerous ethical violations — from sleeping with a jailed client’s wife to telling people he had filed lawsuits when he had not, court records show. The recommendation that Grim be disbarred stems from three recent cases. Armendariz, a judge who hears disciplinary cases against lawyers, found that Grim failed to act competently for clients, didn’t follow court orders, didn’t communicate with clients and did not return $7,300 to an incarcerated client after not providing services. In one instance, Grim didn’t answer more than two dozen requests from a client for an update on a criminal appeal. Armendariz’s recommendation must be approved by the state Supreme Court. Supreme Court spokeswoman Lynn Holton said Wednesday no action is yet scheduled. Grim started representing Broussard in August 2007, soon after the then 19-year-old confessed to shooting Bailey. Grim was recommended to Broussard by an uncle whom Grim had once successfully defended on a murder charge. From his musty office above a bail bonds shop across from San Francisco’s Hall of Justice, Grim was soon releasing police evidence against Broussard to a wide array of media. The documents indicated that Broussard had not acted alone in the killing. Grim counseled Broussard to appear on the CBS News program “60 Minutes,” where Broussard recanted his confession and said he would reveal Bailey’s true killer at trial. But, as his trial date approached in 2009, Broussard told Grim to negotiate a deal. Broussard eventually confessed to killing Bailey and another man, Odell Roberson, at the order of Yusuf Bey IV, then leader of Your Black Muslim Bakery. Broussard also said Bey IV and another bakery member, Antoine Mackey, had told him they killed another man, Michael Wills. Broussard agreed to plead guilty to two counts of voluntary manslaughter and was sentenced to 25 years in prison after testifying last year against Bey IV and Mackey, both 26.